If you thought the small child in the final song of All of Us looked fully at ease on the big Jubilee stage, it's because little Emma is perfectly at home with the Alberta Ballet cast. 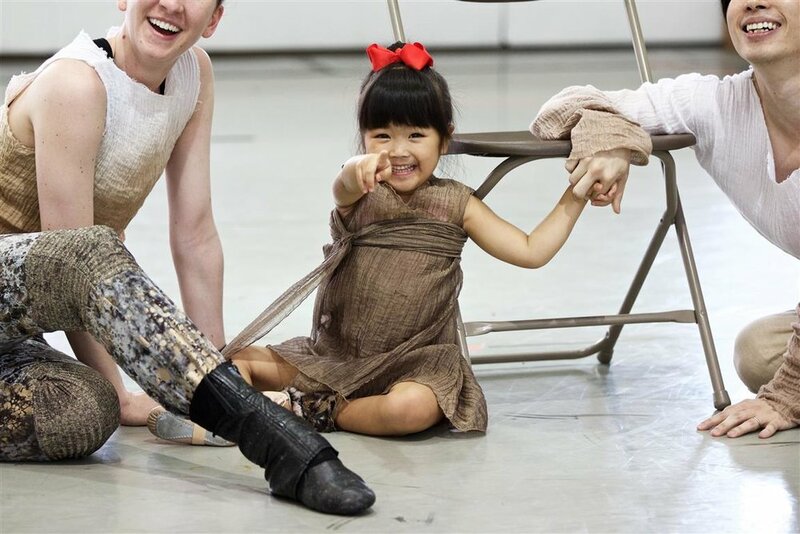 Daughter of Company Dancer Mariko Kondo, Emma was a superstar throughout the production, whether brilliantly following Jean Grand-Maitre's choreography or hanging with the dancers while waiting for her cue. She played a starring role on stage and behind-the-scenes. Emma was Jean Grand-Maitre's first choice for the little girl in the final song of All of Us. This character was infused with symbolism: she represented optimism and hope for the new world ahead. Jean knew for a child of this age to succeed in the task, the child had to be comfortable with the dancers. Fortunately, the dancers of Alberta Ballet had a close and ready network to make such a casting directive easy to fulfill. "Dancers often leave home at a very young age and because of this harsh reality, their dance colleagues often become their second family," says Artistic Director Jean Grand-Maitre. Mariko Kondo has been with Alberta Ballet since 2007. We expect that little Emma's comfort on stage has something to do with the ballet DNA she gets from her mom. But Emma's ease on stage is also a reflection of the fact that, for as long as she can remember, Emma has known her All of Us cast members as her extended family. "As dancers mature together, they fall in love, marry and have children. It's not uncommon for other dancers to be considered as uncles and aunts to the newborns. As the babies grow, they sometimes are cast in some of our productions. It's a truly unique and magical quality of this very special community," says Jean.